Once upon a time there was a kingdom in the Himalayas called Nepal. People in the outside world also called it the Land of the Sherpas, the Land of Yetis and Yaks, the Land of the famous Gurkhas and the Land of the highest mountains in the world. It was ruled by a Gorkha king named Prithvi Narayan Shah, who in 1768 brought the different kingdoms together through his conquests. The rise of the House of Gorkhas (Shah dynasty) has endured since 238 years till November 21,2006. In 1974, I happened to be a part of a scenario known as the 'Back to the Village Campaign.' It was a strange sight in the mountain kingdom of Nepal, which was a forbidden land twenty-four years ago. University professors, lecturers, bank managers, His Majesty's section officers and other cadres, who normally barked at peons in the offices of His Majesty's Government to bring them tea and snacks from the nearby tea-shops, were digging with shovels, lifting stones, plastering up the stone blocks with cement. The place was a remote locality of the Balambu village panchayat. And the motley crowd of workers were urbanized white-collar job-holders and citizens of Nepal, working shoulder to shoulder with their rural brothers under the 'Go to the Village National Campaign'. The national campaign had a branch office at Balambu, which was located 18-kilometres from Kathmandu along the Kathmandu-Thankot road. In 1975, with a view to enable one to acquire first-hand knowledge regarding the progress made by the government and semi-government workers in the development tasks of the village panchayats in the suburbs of Kathmandu Valley, a couple of journalists from the pro-government media: The Rising Nepal, Gorkhapatra and Radio Nepal were invited to take part in a surprise whirlwind tour of these areas. The ten panchayats where the Go to the Village National Campaign was being implemented in the valley were: Naikab-Nayabhanjyang, Purano Bhanjyang, Saritartha, Machhegaon, Mahadevsthan, Thankot, Dahachowk - Chowketar and Ward-Bhanjyang. The Go to the Village Campaign was the brainchild of King Mahendra, the father of King Gyanendra Shah, and was launched in the Nepalese month of Pousch 1, 2024 (Nepalese calendar). The National Campaign was intended to mobilize the masses, taking into consideration the fact that Nepal was predominantly an agriculture-based country. A country where the village forms the most important unit. And every village had its five elders who so-to-say ran the village. It was believed in the palace circles, and in the panchayat government, that if there was to be an awakening at all in the country, it had to come from the rural masses of Nepal, and a so-called tentative ten-point programme was implemented in the villages of the kingdom, in which His Majesty's civil servants, students and workers from the urban areas were deputed to go to the villages and help 'to strengthen and popularize the sentiment of nationalism and national unity'. Nepal's masses were to be acquainted with the Panchayat Democracy, and thereby develop and further strengthen it. The panchas at the grassroot-level were required to stick to the principles of the non-aligned foreign policy that the country had adopted, a far sighted policy of the ruling Shah dynasty to maintain their power. As long as you were non-aligned, you could rule a kingdom as you pleased, and there were no allies who'd look over the shoulder and protest when human and other rights were misused. The Kingdom of Nepal had always been a special case as far as geo-politics were concerned. India had a patronizing attitude towards Nepal because it was the only Hindu Kingdom, and India's Hindus and Buddhists flocked to Kathmandu's holy temples like Pashupati and Swayambhu. After all the Goddess Sita from the Ramayana came from the Nepalese town of Janakpur. Moreover, Gautama Buddha was a prince from Lumbini, another place of pilgrimage for the Buddhists and Hindus. Thanks to the assistance of Japan's Zen and Shinto Buddhists, Lumbini is an attractive place now. A campaign was to be started against corruption, injustice, oppression and bungling of works that were of national reverence. The campaign was to make the village population active and conscious. Efforts were to be made to render assistance for the successful implementation of the existing land-reforms, civil code, social reforms and development works which had a national bearing. The idea of cooperatives was to be expanded and propagated. The people were to be made aware of the importance of the forests and wildlife, and were to be encouraged to plant tree-saplings. Since agriculture was the mainstay of the country, agricultural output was to be given greater priority. Cottage industries were to be encouraged and extended in keeping with the blueprint of the national campaign. All this was the gist of the Go to the Village National Campaign, which a Nepalese linguist named Tara Nath Sharma once dubbed as 'an echo of Mao Zedong's repressive measure of closing down the universities and sending teachers, intellectuals and writers to villages for mandatory manual labor during the Chinese Cultural Revolution. Showcase villages were taken as examples and the development under the Panchayat government shown to the media. Prior to the implementation of the National Campaign, modern medical facilities were unheard of in a village like Satungal and the local population had to resort to the shamans of the village, who would practice their 'strange, archaic, unscientific, mysterious and useless occult art on the simple taboo-ridden villagers (sic).' The exorcists and shamans didn't demand money for their services, but the villagers paid them in kind, by sacrificing their best roosters, goats and other animals. Things slowly changed and a dispensary was set up by the local unit of the Campaign, and the doctors started coming on a three-day rotation to the village and treated the patients. Sample medicines were distributed 'whenever possible' (most of the time it wasn't possible), and the dispensary trained volunteers from the ten panchayats of the area as health assistants. Some of the diseases that were (and still are) common tend to be: ascariasis, hepatitis, colitis, amoebiasis and malnutrition in general. The villagers talked about the family-planning programme, which was also active in the hamlet and the rural population of the village had been vaccinated. At Chowkitar village, a farmer showed the patch where he was growing pear, plum and peach from the seeds provided by the Campaign and which had been distributed by the local panchayat office. I had the impression that simple Nepalese villagers didn't know that the seeds that were distributed by their respective panchayats could be used by them, and they'd be free to make a profit out of the produce. Nobody had told them anything about it. There was an unspoken loathing on the part of the villagers, when it came to interactions with the government officials. Many farmers seemed to have the notion that the products obtained through the use of government seeds would be confiscated. That the villagers were fully aware of the importance of the forests was amply evident in the higher reaches of the villages, for the mountains were dotted with saplings of Pinus roxburghii. The saplings were, of course, provided by the Department of Forestry, and the planting was done exclusively by the Campaign workers. The farmers were too apprehensive about the consequences of bureaucratic involvement. Soil erosion, which has been a prime factor for the lessening of yield in the remote areas of Nepal, can be checked to a considerable extent through the much-publicized tree-planting ventures. 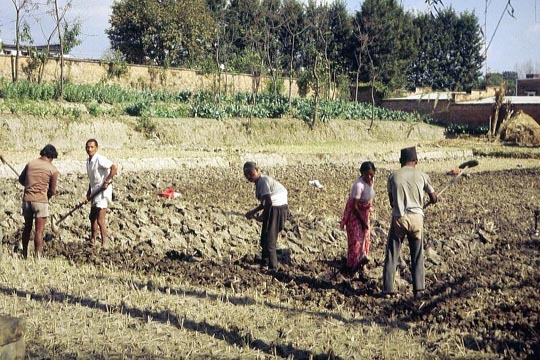 The Nepalese farmers were shown films of the royal family King Birendra, Queen Aishwarya, Crown Prince Dipendra, and the other two princes Gyanendra and Dhirendra planting saplings in different regions of Nepal to the accompaniment of the ironical song 'Nepal ko dhana, hariyo bana' (Nepal's wealth is its forests). If, for instance, there was a conflict regarding land-ownership- rights in the Eastern part of Nepal, as in the case of my college-friend Karki, the petition had to be filed in front of the Narayanhiti Royal Palace as a last instance of justice on earth. Even though Mr. Karki was educated in a college in Kathmandu, and could read and write in Nepali and English, he was obliged to have a petition filed, and written, by an official petition-writer, whose duty was to write a letter in longhand with sentences that were standard examples in circumlocution and archaic, courtly, subservient manners of expression. Having paid the writer for his trouble and artistry, one had to leave the matter to the Gods, and wait and pray that it be heard somewhere in the chambers of the spacious, modern Narayanhiti palace. For Vishnu, who is also called Budanilkantha in Nepal, reposes on his bed of serpents in the primeval waters, couldn't be bothered with such earthly matters. Vishnu's preserving and restoring power has, in the past, been manifested to the world in a variety of forms through his incarnations. During a visit to Lalitput I met Tschering Lama, a lean, bespectacled, restaurant-owner, who'd bought a plot of land smack on the shore of the beautiful Phewa Lake in Pokhara (Central Nepal). He was extremely proud of his new acquisition. Sometime later, when he actually wanted to build a house on his patch of virgin Nepalese earth, he came to know that the land definitely hadn't belonged to the man he'd bought it from, and that his purchase document wasn't worth a rupee. The land was the property of the Royal Family, and as such, not for sale to the commoners. Mr. Lama was awfully disappointed, frustrated and depressed, because his life-savings had gone in this bargain. He'd had plans to build a lodge for the foreign tourists and also cater to their gastronomic delights. And there he was, a broken man with a glum expression on his face. He did have his smart attitude though, and that's one trait I really admire among the Nepalese from the mountains. They keep a stiff upper lip. You can see this smartness even under desperate situations amongst the hill-tribes and the Gurkha war-veterans from Flanders to the Falklands. The Nepalese are indeed a stoic, proud and sympathetic people, and a visitor to Nepal notices it, and learns to cherish it after a journey in the teeming cities, crowded trains and blazing plains of the Indian subcontinent. If you've had the pleasure of traveling around in India with its maddening crowds, a visit to Nepal can be so exhilarating. Due to the tourism trade, the tourist or traveler might be pestered by curio-sellers and money-changers in Kathmandu's famous Freak Street (Jochhey Tole, as the Newars call it) and at the bazaars in Thamel. But the people in the countryside are grateful if, and when, they have visitors. These visitors were, before the tourists came en masse, travelers, ascetic holy men (sadhus), monks and pilgrims, or trading Thakalis and Tibetans with mule and yak caravans, and it was normal for the travelers to be questioned about their heritage, caste, birthplace and so forth. A Nepalese invariably asks, 'tapaiko jat kay ho?' Which caste do you belong to? This is because the caste-system and tribe-clans are well-established in Nepal, and every Nepalese name also bears evidence to his or her caste or tribe. For instance: Birendra Bahadur Karki. The first name is this case is Birendra, and then comes 'Bahadur', which means 'courageous' because all Nepalese males would like their sons to be brave and courageous. And finally 'Karki', which denotes that the person belongs to the sub-caste of the Chettris, the second highest order in the Nepalese Hindu hierarchy. The life of a Hindu, from birth till his remains are turned to ashes, is saturated with religion. Everything he or she does, even eating and drinking, is connected with a religious ceremony. Whereas India has thrown away the shackles of colonialism, as well as the privilege of hundreds of Rajas and Maharajas, because it is a secular state in accordance to its constitution, Nepal still remains Hindu, perhaps due to the fact that its doors were closed to the outside world, and foreign influence kept at bay. But in this Himalayan enclave which has been conserved by dynasties of Shah kings and Ranas who usurped the throne, there are also other ethnic Nepalese who practice other religions, like Buddhism, Animism, Islam etc. India has solved the problems of underprivileged tribes and castes by giving them the status of 'scheduled' and has created scholarships from the school-level to the University level. The reason why the Maobadis under Pushpa Kamal Dahal, alias Comrade Prachandra, became stronger in West Nepal (Rukum, Rolpa, Jajarkot und Salyan) was because of Nepal's general poverty, corruption, nepotism and lack of perspective. Only a small section of the Nepalese population benefited from the schools, colleges und universities and the blessing of Nepal-aid from foreign countries and mountain-tourism. The Maobadis are fighting now for the banishment of monarchy and removal of the feudal structures in the society. In Nepal it was always difficult for a poor dalit (lower caste) or someone from the hill-tribes to set foot in Kathmandu, and give them a good education. It is a sad fact that only the rich can send their children to the best English schools in Kathmandu, Darjeeling, Kalimpong or Gorakhpur. The rest of the Nepalese parents sent their children to the government-run schools, where the standard of education was miserable. Nevertheless, thousands of Nepalese students pass their School Leaving Certificate exams and go to colleges and universities, with an English handicap. In the Hindu society of Nepal, the King has always been the patriarch, who swears to his descent from ancient Vedic heroes who were worshipped by the people. A Newsweek interview with the former King Birendra Shah also didn't help to throw new light into this ancient tradition, for His Majesty coughed up a diplomatic reply and that was it. The Bada Raj Guru, a Brahmin, was the first State Minister in ancient times, though the Nepalese Raj Guru has still retained his power, because in this Hindu set-up every governmental or stately decision is associated with a religious ceremony. For instance when the King of Nepal leaves his Narayanhiti Palace and visits his own country or other countries, the court astrologer is consulted to choose an auspicious day. The King is for the Hindus, not only the protector and preserver of ancient Hindu culture, but is also a manifestation of tradition and development in the Hindu world. In September 1995, I was astonished how far the winds of democracy had swayed into Kathmandu valley. In Kathmandu Valley there are three former kingdoms: Kathmandu, Bhaktapur (Bhadgaon) and Patan (Lalitpur). At the Rato Bangala, an elite school in Patan smack in the middle of the Sri Durbar, run by a dear family I personally know, I had the privilege of taking part at a school theatre and there were parents and guests from Kathmandu's upper society. A literary natak (play) in Nepali was staged, in which the protagonists played the role of the people of Kirtipur during the times of Prithivi Narayan Shah. The entire play was from the viewpoint of the besieged and cheated Kirtipurians, and not from the angle of the attacking and marauding Gorkha king in 1768. I found it rather innovative and courageous on the part of Patan's man-of-letters Mr. Kamal Mani Dixit, in comparison to the pre-democracy days when everything was controlled, and lips feared to speak about human rights and democracy. The people of Kirtipur had put up a brilliant fight in those days, but were defeated, and the males of this brave kingdom, located on a hillock near the Tribhuvan University, had to pay a terrible price. The Shah king ordered the lips and ears of the Kirtipurians to be cut. Only the traditional wind-instrument players retained their lips and ears. It was a bloody affair with a huge pile of lips and ears. The barbaric treatment meted out to the Kirtipurians spread like wildfire in the other parts of Kathmandu Valley and soon Patan, Bhaktapur and Kathmandu fell. If you are planning to go to Nepal soon, do visit the brave town of Kirtipur, near Kathmandu. The triple-roofed Bagh Bhairab temple walls in Kirtipur are still decorated with swords and shields of the Kirtipurian troops defeated by Prithivi Narayan Shah's victorious Gorkha army. There is also an image of Vishnu astride the Garuda. Underneath you'll see the elephant-headed God Ganesh and Kumar. The Nepalese king is also revered as an incarnation of the Hindu God Vishnu. I don't want to sound like Borat, but blood sacrifices are made on two auspicious days: Tuesday and Saturday mornings. Another place in Kathmandu valley where such blood-sacrifices are made is in the temple of the Southern-Kali, where the Nepalese cook their lunch and have a feast after the temple visit. I had a chance to meet King Birendra at the reception in La Redoute (Bonn) and had a small talk with such niceties as 'How long are you in Germany? When are you returning?' At the Graf Zeppelin Hotel in Stuttgart and Echterdingen airport, where I had the opportunity of handing Queen Ayeshwarya, who was a fellow poet despite her cruel role during the democracy revolution in 1990, a bouquet of flowers which I'd brought along from Freiburg im Breisgau. The late Madame Busak, the Stuttgarter Royal Nepalese honorary consul, was also there, in addition to Herrn Sp'th, the then Minister-Pr'sident of Baden-W'rttemberg. The Nepalese anthem never sounded more nostalgic then, and the traditionally quaint, triangular Hindu Nepalese flags fluttered in Stuttgart's windy airport as the Bundesgrenzschutz played the Nepalese and German anthems. In the meantime, Nepal's multi-party government and the Maobadis have signed a peace accord and declared a formal end to a ten-year war of terror that killed more than 13,000 Nepalese. The agreement paves the way for the Maoists to give up their weapons and be confined to UN-monitored camps. An assembly will draft a new constitution and decide the future of the King Gyanendra Shah's dynasty as the monarch of Nepal. One thing is definite: the Maoists and the other communists don't want the 200 year old monarchy anymore. What is encouraging, and curious, is that they have vowed to honor the outcome, even if the assembly decides to maintain a ceremonial monarch, stripped of his powers. A new wind blows in the Himalayas. Will the Maobadis give up all their arms like the Khampas (Tibetan freedom fighters from Eastern Tibet who'd come to Langtang) did in 1974, after they were confronted by the Royal Gurkhas? With a little bit of monitoring from the UN and Swiss officers, it might be possible to fill up a few containers, but will all the Maobadis surrender their arms? We can only hope and trust them to do so. What will happen to the angry, restless, mobilized Maobadi fighters and child soldiers? Will they go back to their schools, if not destroyed, or for treatment in case they are traumatized? Will there be social programs for those who suffered under the atrocities of the government troops and the Maobadis? There's a lot to be done in this country under the shadow of the Himalayas. Will it be a back to the village dream, after the triumphal march of the Maobadis into Kathmandu, heads and hands smeared with red vermilion powder and automatic guns in their hands? Or will the new government use the manpower resources by mobilizing and subliming their youthful energies, towards the development of new jobs and a new economy?